To optimize the energy usage and to support people with well illuminated streets at night in rural areas, the SmartLighting concept has been developed at Anhalt University of Applied Sciences. The goal of the project is to create a large-scale wireless sensor network over the existing street lighting infrastructure in order to establish a SmartLighting system. In this system the maximum amount of power will be used only at the spots, at which it is needed and only when it is needed. The system fully relies on pedestrians traffic, calculates and provides necessary lighting zones depending on their movement direction, while the street areas without any movements remaining unlighted. This leads to a decrease of overall street lamps' working time, saving a huge amount of energy and prolonging the lamps life cycle. The system can be represented as a set of streetlights with special devices attached to them. Each device has a number of necessary modules, such as motion sensors, like IR or ultrasound sensors, lamps and communication appliances for the cooperation with neighboring nodes. Therefore, each node of the system operates autonomously and independently with a purpose to send messages about some activity or inactivity (e.g., a man is moving to some direction) to the other cooperating nodes. The communication among the nodes is assumed to take place either in wireless (e.g., 802.11, 802.15.4 standards) or wired (using PLC technology) environment. 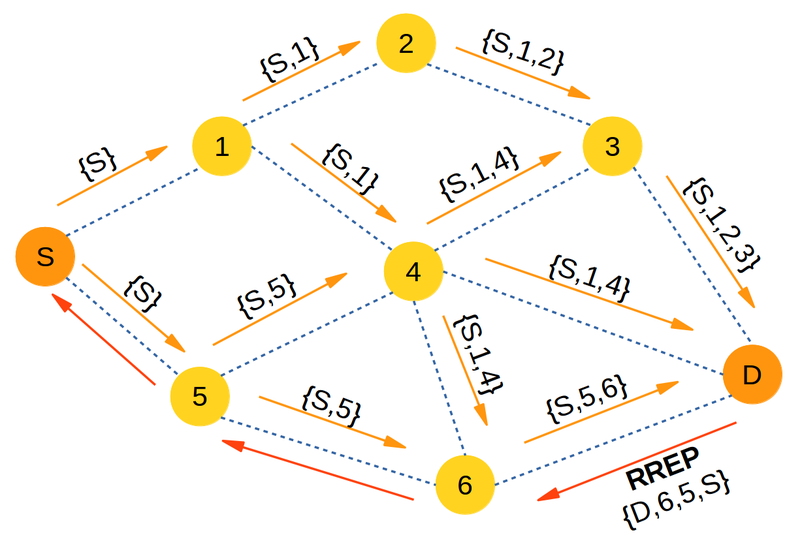 A number of such nodes can be considered as an ad-hoc network with a static topology whose main objective is to share the information between each other quickly and reliably. So, the underlying data network comprises a basis which provides a correct functionality of the SmartLighting system. An example of possible application scenario is shown in Figure 1. The proposed lighting system is deployed on some part of a town as a number of streetlights with attached controller devices, covering the streets. During the dark time of day when artificial lighting is needed, pedestrians are walking along the street in a chosen direction. One of the system's nodes detects the pedestrian with an aid of IR or ultrasound motion sensors. At this instant, the node gives a signal to switch on the light in the corresponding lighting mast and sends a message to its neighbors containing the information about the occurred event (a pedestrian has appeared or disappeared, its velocity, direction, location etc.). 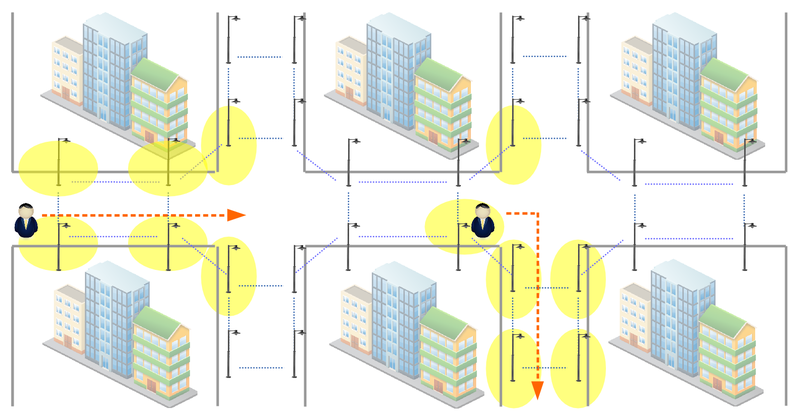 After receiving the message from the originating node, the neighboring nodes know the information about the event and, based on it, they can determine their further actions – either switch on the light (when the pedestrian is approaching) or switch off (when he is moving away) and send an updated information to the other nodes. In this way, the pedestrian's path is being constantly illuminated until he leaves the coverage area of the system. Thus, the system provides comfortable illumination for people along their path while saving a substantial amount of energy during their absence. The application continuously gets information from the external environment via set of sensors, as well as efficiently performs inter-communication between every other nodes in the network for the purposes of auto-configuration, service and data information exchange. Those functions are described below. Also, 2 miscellaneous features, related to the application domain – auto-configuration and inter-node communication routine – are described in Section 3 and 4, correspondingly. The key idea behind that – is to use sensors and nodes interconnectivity to predict a movement direction (or, a vector) of a detected object (pedestrian, car, etc.). The system writes timestamps of the occurred events, and, based on the expected arrival time interval of an object – the neighboring nodes make decisions to switch on the lighting zone along the vector (Figure 2). The lighting zone detection algorithm focuses on effective message delivery through the lamppost network, based on the previously calculated movement vector. 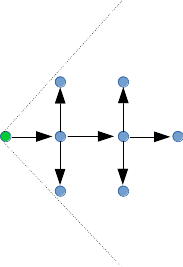 Given the input parameters: movement vector and number of lamps to be switched on in forward (F), backward (B), left (L), right (R) directions – the system forms a tuple (<vector, F, B, L, R>) and broadcasts it further to the neighboring nodes. The neighbors receive the message, and, depending on their position in the network, forward the message further, or discard it (Figure 3). In that way, the appropriate illumination zone along the movement direction is provided. One of the key issues essential for the system's implementation, is an auto-configuration problem and location discovery mechanism, in particular. It is obvious, that in order to function properly, the system has to know the exact location of all communication nodes and lighting masts around it at any instant. Those 2 main objectives are explained in detail next. For the purposes of inter-network communication, IPv6 addressing scheme is used with special header formatting, which includes the information about the node's current state and the nearby environment. 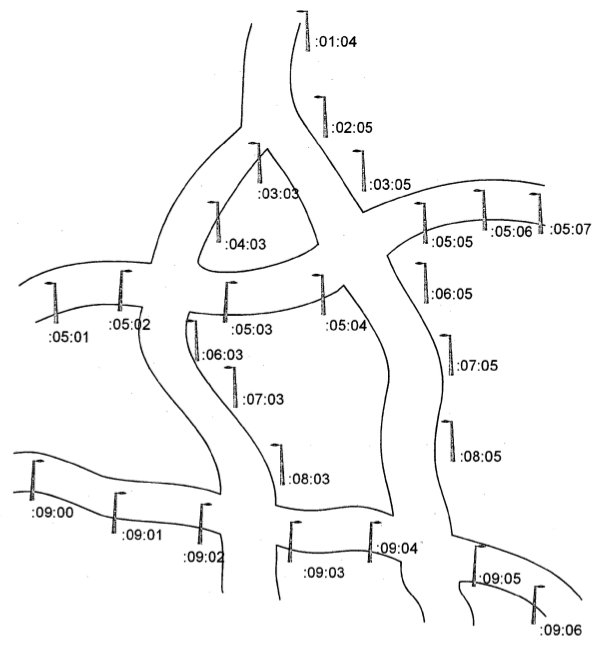 The last bytes of the 16-byte IPv6 address field are used for location discovery purposes  (for example, to insert an explicit information about the location of the node, such as – geographical coordinates, number of the nearest road or building, etc. ), as it is shown on Figure 4. The first solution is quite trivial, although it will significantly increase a total cost of the device and the end-system, and, moreover, the GPS receiver will remain unused most of the time, since all the nodes are static. The second variant is flexible, easy to implement and it will not cause significant additional costs. The third variant is non-trivial and involves some research work, currently being conducted at our lab. An inter-communication functionality plays a very important role in this project, since all the messages (service and application data messages) have to be efficiently routed and delivered to a given destination node, considering wireless or wired transmission medium. In terms of the project, there have been developed a routing protocol based on the improved concept of DSR (Dynamic Source Routing), which showed better performance in terms of average one-way delay, data throughput as well as PLR (packet loss rate). The concept of DSR routing is shown on Figure 5. As for underlying link-layer communication protocol, two possible approaches are being considered – wireless (802.11 wi-fi in ad-hoc mode and 802.15.4 low-energy standard) and wired (Power-Line Communication – PLC), with a priority given to the wireless approach. With this approach, each SmartLighting node (a communication device) will be equipped with wireless 802.11 or 802.15.4 adapter. All upper-layer communication routine will be managed by the node with the developed routing protocol. A big advantage of this solution lies in uniformity of the wireless transmission medium, where all the communication is made through wireless adapters. This makes this solution viable in every possible location or conditions. The PLC technology, at least in theory, could bring better performance comparing to the WiFi solution. However, there is one issue which makes this approach less possible to apply. PLC relies on the existing power line infrastructure and its performance varies significantly depending on the physical parameters of the wires, number of power transformers and so on. Therefore, in order to install the system based on PLC, there should be done additional research on the matter of underlying power line infrastructure, used at the given lampposts. The hardware should contain a set of motion detection sensors, communication interfaces (PLC, 802.11 or 802.15.4), Linux-based SoC controller, power lamp controller. For a testing purpose, there have been developed a Smartlighting system prototype (Figure 6). The prototype testbed consists of 20 custom designed small lamps, with a controller for the sensor and the lamp, attached to it. It includes several communication appliances: WLAN module, 802.15.4 radio module, power line communication module, as well as motion sensors: PIR, ultrasonic. The core component of the controller here is the ARM based single board computer. All other components are connected to the SBC. This board is operated by Linux operating system which runs the developed applications. A Beaglebone SoC  is used for this purpose, representing quite powerful, easy to enhance and well documented platform for development purposes. A network of 19 SmartLighting subsystems using PIR sensors and Wifi components was installed in late 2017 along a road in Bernburg-Strenzfeld. The installation supplies light to cyclists along a road connecting Bernburg-Strenzfeld with its Hochschule Anhalt Campus and the main urban area of the city of Bernburg. Two of the subsystems have internet connection by mobile phone. The SmartLighting networks enables a string of off-grid lights with photovoltaic panels and batteries to supply sufficient light by savings of more than 90% of the otherwise necessary electrical power. SmartLighting's computing capabilities were also used to monitor the status of the batteries and power generaiton, which helped to get the installation running during the winter time with minial light hours and frequent overcast conditions. An offgrid solution wihtout SmartLighitng would have required vastly bigger and thus more expensive photovoltaic panels and batteries. The regional television station MDR televised a report about the SmartLighting installation in Bernburg Strenzfeld. 5. D. Dugaev, S. Zinov, E. Siemens A Survey of Multi-Hop Routing Schemes in Wireless Networks applied for the Smartlighting Scenario // Proceedings of V international science conference “Technologies and equipment for information measurement”, Tomsk, Russia, 2014.